Eli Epstein held the chair of Second Horn of the Cleveland Orchestra from 1987-2005 and taught horn at the Cleveland Institute of Music from 1989-2005. He currently lives and works in Boston in a variety of positions, including serving on the faculty of the New England Conservatory of Music. Needless to say, the primary focus of this book is the horn. 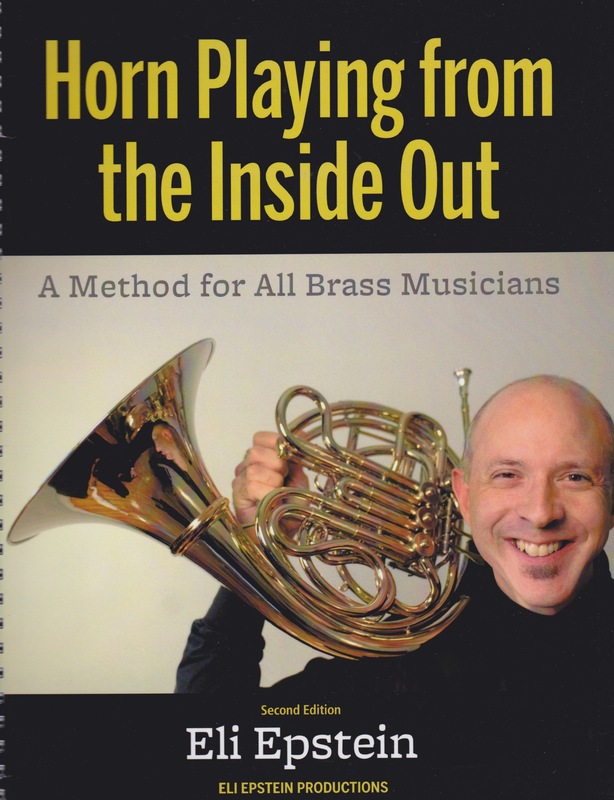 Of the book’s four main sections, the final section, spanning from p.87 to p.149 is a discussion of horn excerpts applying some of the book’s principles for effective performance. Part III, “Power Warm-Up and Daily Exercises” also is designed for horn. This is not to say trombonists won’t find material of value here but clearly some adaptation is needed. For this review, I’ll focus primarily on those sections of the book most relevant to trombonists. In Section 1, “The Basics,” Epstein discusses posture, breathing, embouchure, articulation, the ‘elevators,’ dynamics, and finger breathing. Epstein’s concept of ‘elevators’ is interesting. He argues that the term ‘lip slurs’ is something of a misnomer. Instead, changes through the overtone series are generated by “regulating the speed of the air going through the aperture…using vowels and elevators.” The term ‘elevator’ refers to subtle changes in the position of the lower jaw. The most interesting chapter of this book is Chapter 8, “Finger Breathing: An Intuitive and Kinesthetic Path to Learning the Epstein Methods.” Epstein’s basic finger breath involves the technique of placing the hand vertically in front of the mouth while touching the mouth. Thus a sucking sound is created outside the mouth during inhalation. Epstein’s next instruction is quite interesting, “Now place your index finger next to your mouth in the same manner as before and inhale while trying to produce the pitches that you wish to play on hour horn. Try to imitate the sound you might hear in a haunted house – imagine the wind rushing through a broken window on a dark and stormy night. Or you might want to mimic the sucking sound of a vacuum cleaner with a crevice tool attachment.” Later in the book, Epstein presents horn excerpts with a ‘methods staff’ above the music staff. This ‘methods staff’ precisely notates three details for every note: (1) the vowel shape recommended for each note using words such as “tie,” “tee,” or “tsoo.”;  (2) an additional staff with x’s to show the point of articulation; (3) the recommended ‘elevator floor’ (jaw position) for that note. This feels like informational overload but I’m willing to concede that, with consistent practice over time these details can become second nature. This level of precise detail may have come about because of that acoustic peril faced by all horn players given that they play higher in their overtone series where partials sit much closer together. Not surprisingly, most of his discussion of posture is specific to the horn although I do have to take exception with his advice, “keep feet flat on the floor…” Given varying chair sizes and player sizes this prescription won’t work for some people. I have always preferred “knees below hips.” His prescriptions for breathing include excellent quotes from Alexander Technique expert, Barbara Conable. He also includes interesting analogies in describing breath support. For example, he states, “Imagine that snowplows in your abdominal cavity are constantly pushing down and out, as if compacting piles of snow against your pelvic floor and lower abdominal wall. It’s this dynamic muscular movement that creates excellent breath support.” Personally, I have mixed feelings about such advice but it may prove helpful to some trombonists. In his embouchure discussion, Epstein advocates the 2/3 upper, 1/3 lower mouthpiece positioning and that “the mouthpiece rim should remain in the same position on the lips in all registers.” This advice runs counter to the Reinhardt pivot system with which one either agrees or disagrees. Given the smaller size of the horn mouthpiece, I’m not sure how well this will translate to the trombone. In his section, “Introducing Horn Embouchure to a New Student,” his first step is to “Smile pleasantly.” I do worry about this embouchure advice since it implies raising the embouchure corners, something I don’t recommend. The wealth of content in this book includes worksheet sections for the reader to fill out. A sample cue question reads, “How would you describe yourself as a listener when others perform?” While I don’t agree with everything here, trombonists can benefit from much in this method, which includes excellent advice.